This PDF 1.5 document has been generated by Microsoft® Word 2010, and has been sent on pdf-archive.com on 25/12/2015 at 22:24, from IP address 84.255.x.x. The current document download page has been viewed 262 times. File size: 165 KB (3 pages). interactive projects are now being built with Flash elements or entirely in Flash. allows you to create an entertaining piece with visuals, animation and audio. walk, etc), or anything else. be clear what the project's purpose is. something that you would be proud to show your friends. design theme and color scheme throughout. proceed to fill the layout with the needed information and images. read and navigate are best. Stay with a consistent color scheme. Minimize the use of different fonts and animations. 2. Trace and/or scan and edit the design elements in Illustrator, or Photoshop. 3. Draw your interactive flow chart. (pc) or aif (mac) file. 5. 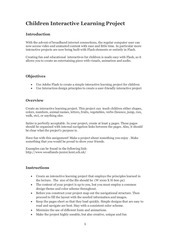 Construct the project in Flash. 6. Test the interactive for any faults/bugs. that contains the report. Please use a unique name for each file. one will be allowed to present without the CD or USB. This file has been shared by a user of PDF Archive. Document ID: 00326783.